I started tweeting a few months back. The first thing that I came to know about Twitter is that ‘anyone’ can follow (or be friend) anybody! Next things were, you tweet something good and get followed by spammers, pornbots, and poor mktg’bots! Spending more time on Twitter, help me exploring it...I came to kno about many a Non-celeb Twit’erbities, being followed by 1000s to millions of followers. I discovered the use of participation in #trends. Through some avid twipples like @HNatarajan, @anddjournal, etc tweetverse etiquettes were learnt by me. One thing that I really noticed is that including anything reltd with money, mktg etc makes the twit’bio repulsive. A lot of articles are available online about how to be good to be followed sincerely by your followers, what are the do’s and don’ts one should adhere to earn a good follower number, 10 things you should never/always do on twitter, and all the blah blah blah.... so, clearly this post is not about any gyan-spreading! It’s @TataDocomo thing that I’m goin to talk about today. To start with, let’s have a ltl knowledge abt TataDocomo...Tata is well-known in India...for everything...salt to steel, IT to telecom, gold to clothing! In fact, my first personal fone was also TataIndicom that I bought because I wanted some free airtime, good handset, and cheap SMS! And, I was not at all betrayed ,,,,it gave me everything with a really admiring voice quality. Now m on another service, though my old no. is still in use, by my parents. And, Docomo, as I browsed online, is a Japanese telecom giant, abbreviated for "Do Communications over the Mobile network", derived from a Japanese word dokomo meaning “everywhere”! 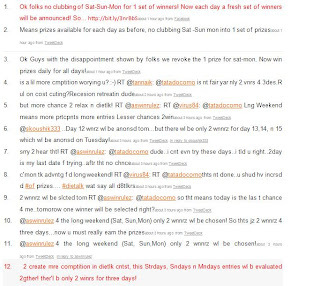 So, they, TataDocomo together, launched a really impressive online campaign (contest) as Dietalk on Twitter, Orkut, Facebook, G/Y/MS IMs together jus within a few months of their launch in India. The motto was to promote thr USP i.e Diet-Talk or “pay per letter” SMService! And, viola they did it! The campaign is a blast on Twitter. Since 2nd June 2009, when they joined it, they have earned about 3800 followers, and have already been listed on 29 lists! The reason goes to sincere mktg thru #Dietalk campaign, which was launched on 19th October and earned them about 2000 followers, rather dedicated dietalkers within 2 weeks! Wow! The trend #dietalk is always within the top 10 Hot Indian Topics since 19th October, as per http://www.90di.com/twitter/2009-10-29/, only wice out of top 5, with over 900 tweets each day! And, not only on Twitter, they are appraised on Facebook and Orkut also, with over 13,000 fans on FB and about 26,000 members on Orkut. The best one can learn from this great campaign of TataDocomo is the Service-People bond! Using a social networking site, effectively and strategically is greatly exemplified by this spl case! Not, only this campaign achieved success in bonding with the people who will be using it, but also started a young-casual though-revolution of Diet’Talking, talking effectvly in lesser characters! I myself find it difficult, but interesting! Hi, Punit! Great to know you through Twitter! Don't worry, I am a spammer or something that you have mentioned in the above post! I am a blogger and like to read people's blog! Hope to exchange ideas here! you may visit my blog www.jumbowing.com. Looking forward to hear from you soon. Wing from Malaysia!